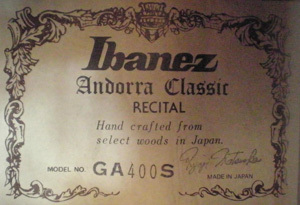 In 1976 Ibanez introduced the Andorra series. Professional players and serious amateurs alike will recognize the quality of the Recital Series classicswith the first chord. The soundboard of these fine instruments are made from selected solid woods for maximum richness and volume. Andorra series specially features flamenco & requint guitar for pro & semi-pro guitarists who love nylon string sound. These instruments are carefully hand built by qualified craftspeople. Beautiful wood marquetry elegantly highlights the top, back and soundhole. I do not know what proportion of Ibanez Andorra guitars were made by Matsuoka. I was on buying an Ibanez Andorra GA400S that I became aware of the fact, The label on this guitar is signed 'Ryoji Matsuoka' (see image above). I have since seen that a number of other Andorra guitars also bear the matsuoka signature. (though this is not always the case).